More information: Revenge-pop? The Prog Karen Carpenter? Barbra Streisand on acid? Bat For Lashes on an obscure book-binge? 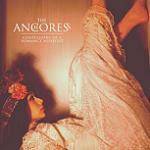 Whichever way you choose to describe Confessions Of A Romance Novelist - the debut album by The Anchoress (co-produced by Mansun's visionary frontman Paul Draper) - one thing's for certain, this is something truly different. Multi-instrumentalist, songwriter, PhD and producer Catherine Anne Davies (aka The Anchoress) sums up her album's overall concept as, "Deconstructing normative ideas of love and romance. With each song sung by a different character, it's what you might call a musical ghost writing of sorts." The Anchoress has been seen on tour with Simple Minds throughout 2015.